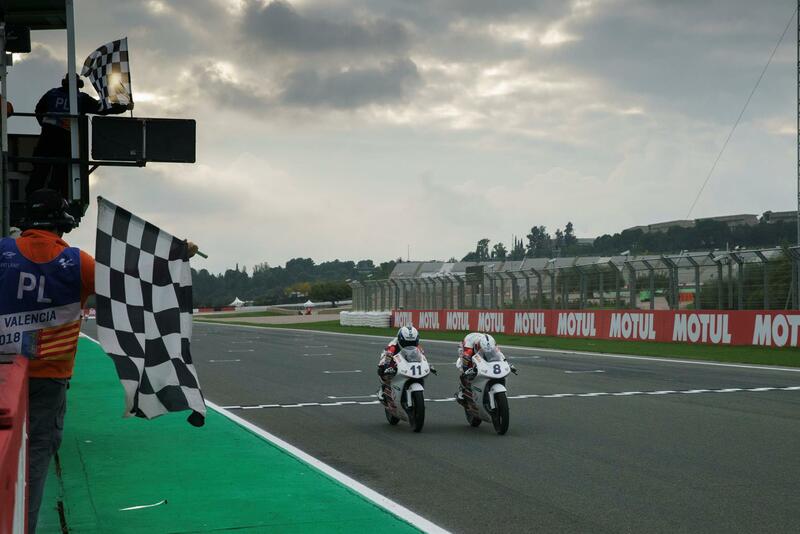 Thomas Strudwick won the final race of the inaugural British Talent Cup in style, pitching the drag to the line to perfection to steal the victory in a stunning photo finish. But the man he pipped to the post, Rory Skinner, takes the title of first ever British Talent Cup champion, with second place more than enough to give him the crown after having begun the race with a 24-point advantage. His remaining rival for the crown, race one winner Max Cook, took third for another rostrum finish. Strudwick took the holeshot from pole, with Skinner slotting into second and Max Cook making a better start in Race 2 to shadow them in third. But bit by bit the duo ahead of the number 5 were able to begin pulling away and another classic duel was born - as Cook fought for his chance at the Cup and the podium. As Skinner took the lead, Strudwick struck back and the two played a perfect cat-and-mouse game at the front. In the latter stages it seemed like Skinner was content to play it safer and take second, but the Scot then dug deep again and came back for another attack and was back in the lead. It seemed like it could be a done deal, but Strudwick had kept his cards close to his chest and despite seeming like a slipstream attack would be impossible, the number 8 played it perfectly. The photo-finish gave him the final win of the season and fans another incredible show, but second for Skinner was more than enough to secure him his ultimate goal: the crown. Max Cook, meanwhile, fought back through to head the second group and completed the podium - not the win he'd needed to try and take the Cup but securing another rostrum finish. Just behind him another great fight raged to the line, with Brian Hart and Fenton Seabright completing the top five. Cameron Horsman took sixth in another strong race, ahead of Scott Ogden, Jack Nixon and Jack Hart. Race one podium finisher Joshua Whatley was just outside the top ten after a tougher race in the dry.